PT Wika Realty, a subsidiary of PT Wijaya Karya (Persero) Tbk. inaugurated the operation of a condominium hotel (condotel) Best Western Premier The Hive in Cawang area, East Jakarta. In addition to building a condotel, PT Wika Realty also build apartments and commercial areas in the Tamansari Hive is built on an area of ? ?6,070 m2, as high as 19 floors plus 3 basement. Castle Development Hive require an investment of Rp300 billion. For apartments, has started since April 2014 and was handed over. This Condotel which is operated by Best Western Inernational with the name Best Western Premier The Hive. Best Western Premier The Hive has many advantages. In addition to its strategic location, which is near the Halim Perdana Kusuma Airport and Taman Mini Indonesia Indah, Best Western Premier The Hive also has a complete hotel facilities with premier service. Among them is a provision of a welcoming refreshment snacks and a welcome drink and juice varied in lobby area, 24-hour free internet connection, free minibar consumption, free calling fellow local area, and supported by the presence of modern electronic devices in every room. So that the guests will get the sensation of a different experience. One of the determinants of investment success Condotel is the right hotel operator selection, therefore PT Wika Realty choosing Best Western International to manage the Hotel Best Western Premier The Hive. "We chose the Best Western International, which already has a lot of experience and have a good reputation in the world," said Budi Saddewa Soediro, President Director of PT Wika Realty. Best Western International is the world's largest hotel chain. Provide support for marketing, reservations and operational to more than 4,100 member hotels are independently owned and operated in 100 countries and territories around the world. As one industry pioneer since 1946, Best Western has grown rapidly to become an iconic brand which hosts 400,000 guests each night. Iwanto Hartojo, Chief Executive Officer (CEO) Best Western International Indonesia Area Development Office said, "We target occupancy rate Best Western Premier The Hive in the first year an average of 65%. As for next year, we are targeting an average occupancy rate of approximately 70-80% and will continue to increase every year. Various strategic we have prepared so that the occupancy rate of hotel Best Western Premier The Hive continue to be high, "said Iwanto. "Among them is to ensure that the services provided by our staff is the quality services according to standards of the Best Western International to ensure the comfort of our guests, whether staying or when events, meetings. We also seek to minimize potential complaints from the guests, "said Iwanto. Penetration and introduction to government agencies and corporate offices around the hotel will also be performed, as well as well as continue to foster good relations and cooperation with the travel agents with offers programs and special promos interesting. Best Western Premier The Hive summarizes the room as much as 191 units consisting of several types of rooms such as Superior (84 rooms), Deluxe (28 rooms), Super Deluxe (42 rooms), Corner Suites (28 rooms), Junior Suite (Room 8), and Premier Suite (1 room). Best Western Premier The Hive will be operated as a 4 + star hotel with a room rate per night ranges from R1 Million late for Superior room type. Hive Castle apartments consist of 422 units, sized 2 bedroom, 1 bedroom and studio. Since launching at the end of 2011. Tamansari Hive responded very well by the market. This was evidenced by the sale of which currently has reached 98% for apartments and 96.86% for the Condotel. "We are optimistic that this year all the units can be sold all. And we are also optimistic that the end users as well as investors who buy an apartment or condotel will get the maximum benefit for the Tamansari Hive has a lot of advantages, "Budi said on the sidelines of the inauguration of the operation of the Hotel Best Western Premier The Hive. For apartments, currently marketed with prices starting at 700 millions. While Condotel cost from Rp800 million. PT Wika Realty Tamansari Hive estimated capital gain per year is equal to 15% -25%, while the Return On Investment (ROI) guarantee a given PT Wika Realty for condotel at 8% per year during the first 2 years. Kukuh Ariadi, Realty Manager Tamansari Hive presents various advantages of the Tamansari Hive. First, the location is very strategic, namely in the area of ? ?Cawang, East Jakarta. Not far from the location of the Tamansari Hive, there Cawang interchanges connecting the various sections freeway or expressway. Hive and apartment dwellers Hotel Best Western Premier The Hive greatly benefit from direct access to the expressway so that their mobilization towards Jakarta, Bogor, Depok, Tangerang, and Bekasi becomes easy and fast. Even if you want to other cities around Greater Jakarta, such as Bandung, Peacock, and others, can be directly through the toll road. Not to mention the right TransJakarta bus lines pass in front of the Tamansari Hive and free 3 in 1. Selan, plans Monorail will pass not far from the Tamansari Hive. "The advantage of this access is not owned by any other location in Jakarta. Even after the operation Halim Perdana Kusuma Airport as a commercial airport, even easier for residents to access the other big cities in Indonesia," said Kukuh. Joint State-Owned Enterprises (BUMN), PT Wika Realty is currently driving the development of Cawang region into the Central Business District (CBD) in East Jakarta and is expected to be equal Thamrin, Kuningan and Sudirman, which is already recognized as a center Jakarta's business. "Currently we are with some other BUMN are being planned in Cawang CBD which will be realized in the near future, together with the Tamansari Hive as potential areas Cawang enormous," said Kukuh. Second, the concept of Tamansari Hive meets the requirements of modern society that is practical and economical life. Adopt a beehive shape, because it was named Hives, inside the building there will be a variety of functions that support each other and work together to become a "nest" that is comfortable, enjoyable, and profitable in accordance with the concept of honeycomb itself. "Just one step toward the elevator, the residents can access the commercial area and building facilities such as Cafe and Restaurant which is on floor 1 and 2, so as to make life more practical and economical," said Kukuh. Support facilities are provided Tamasari Hive, among others Sky pool, Sky Garden, Spa, Gym, Meeting Room, Executive lounge, Business Center, Free Wi-Fi and others. While commercial area located on floors 1 through 3 are designed to meet the daily needs of residents. 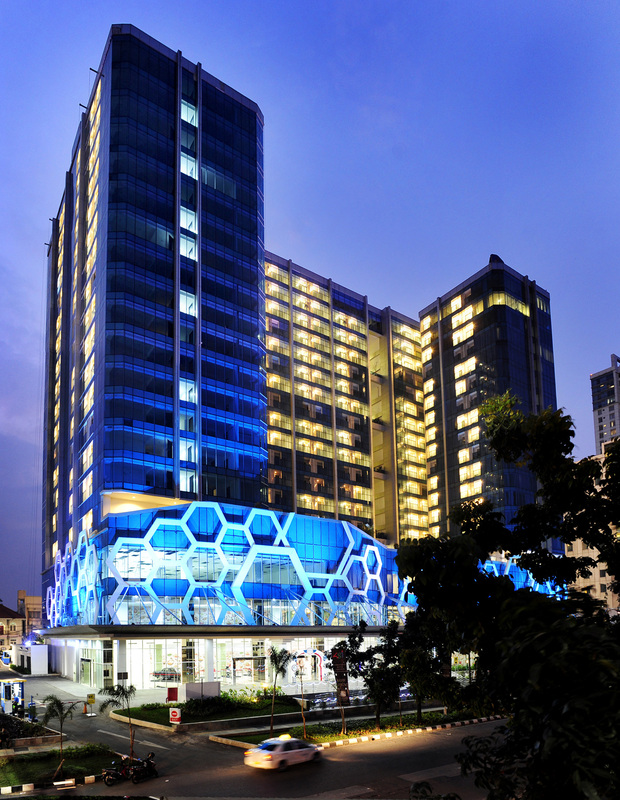 In addition Condotel and apartments, PT Wika Realty also built commercial area for rent in Tamansari Hive. Construction of a commercial area because PT Wika Realty wants to expand the field of business and want to increase the share of sustainable income (recurring income). "This year we can expect recurring income accounted for 10% of total revenue. Projects that can generate recurring income in 2014 besides Puspamaya Hotels in Cengkareng is a commercial area in Tamansari Hive. In addition to the hospitality, the company will also enter the business office / office and retail properties," said Budi. The plan in the near future, PT Wika Realty in cooperation with PT Bina Karya (Persero) will construct an office building right next to the Tamansari Hive.